The HIV Saliva Home Testing kits is a point-of-care test to aid in the diagnosis of infection with HIV-1 and HIV-2. This rapid HIV test provides results with 99.30% accuracy from oral fluid in as little as 20 minutes, thus providing results during the initial visit and enabling immediate counseling. Additionally, this test will be useful for pregnant women who do not know their HIV status at the time of delivery and for health care workers after accidental exposures to body fluids from infected individuals. Acquired Immune Deficiency Syndrome (AIDS), AIDS related complex (ARC) and pre-AIDS are thought to be caused by the Human Immunodeficiency Virus (HIV). The first AIDS-related virus, HIV-1 (also known as HTLV-III, LAV-1 and ARV) has been isolated from patients with AIDS and from healthy persons at high risk for AIDS. Genetic analysis of HIV-1 isolates has documented the existence of subtypes. To date, eight HIV-1 subtypes (A through H), designated as Group M, have been identified world-wide in addition to the highly divergent HIV-1 isolates from AIDS patients in Cameroon, designated as Group O.3 A closely related but distinct second type of pathogenic human immunodeficiency retrovirus, designated HIV-2 (formerly LAV-2), has been isolated from West African patients with AIDS. HIV-2 has been shown to share a number of conserved sequences with HIV-1, but serological cross-reactivity between HIV-1 and HIV-2 has been shown to be highly variable from sample to sample. HIV is known to be transmitted by sexual contact, by exposure to blood (including sharing contaminated needles and syringes) or by contaminated blood products, or it may be transmitted from an infected mother to her fetus during the prenatal period. Individuals infected with HIV produce antibodies against the HIV viral proteins. Testing for the presence of antibodies to HIV in bodily fluids (e.g., blood, oral fluid, and urine) is an accurate aid in the diagnosis of HIV infection. However, the implications of seropositivity must be considered in a clinical context. For example, in neonates, the presence of antibodies to HIV is indicative of exposure to HIV, but not necessarily of HIV infection, due to the acquisition of maternal antibodies that may persist for up to eighteen months. Conversely, absence of antibody to HIV cannot be taken as absolute proof that an individual is free of HIV infection or incapable of transmitting the virus. An antibody response to a recent exposure may take several months to reach detectable levels. HIV has been isolated from asymptomatic, seronegative individuals presumably before seroconversion following exposure. The standard laboratory HIV testing algorithm used in the United States consists of screening with an enzyme immunoassay (EIA) and confirmation of repeatedly reactive EIAs using a Western blot test. Results are typically reported within 48 hours to 2 weeks, making these standard screening and supplemental tests inadequate to meet the need for rapid HIV diagnosis. 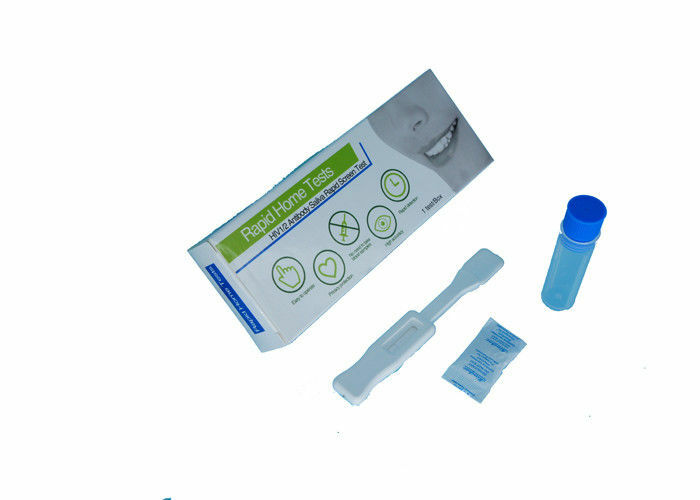 The HIV-1/2 Saliva Antibody Home Test kit is a point-of-care test to aid in the diagnosis of infection with HIV-1 and HIV-2. The HIV-1/2 Saliva Antibody Home Test kit is a manually performed, visually read, 20 minute immunoassay for the qualitative detection of antibodies to HIV-1 and HIV-2 in human oral fluid. The HIV-1/2 Saliva Antibody Home Test kit is comprised of a single-use test device and a single-use vial containing a pre-measured amount of a buffered developer solution. Each component is sealed in separate compartments of a single pouch to form the test. The HIV-1/2 Saliva Antibody Home Test kit utilizes a proprietary lateral flow immunoassay procedure. The device plastic housing holds an assay test strip comprised of several materials that provide the matrix for the immunochromatography of the specimen and the platform for indication of the test results. The assay test strip, which can be viewed through the test device result window, contains synthetic peptides representing the HIV envelope region and a goat anti-human IgG procedural control immobilized onto a nitrocellulose membrane in the Test (T) zone and the Control (C) zone, respectively. An oral fluid specimen is collected using the flat pad on the test device, followed by the insertion of the test device into the vial of developer solution. As the specimen continues to migrate up the strip, it encounters the T zone. If the specimen contains antibodies that react with the antigens immobilized on the nitrocellulose membrane, a reddish-purple line will appear, qualitatively indicating the presence of antibodies to HIV-1 and/or HIV-2 in the specimen. The intensity of the line color is not directly proportional to the amount of antibody present in the specimen. Further up the assay strip, the sample will encounter the C zone. This built-in procedural control serves to demonstrate that a specimen was added to the vial and that the fluid has migrated adequately through the test device. A reddish-purple line will appear in the C zone during the performance of all valid tests, whether or not the sample is positive or negative for antibodies to HIV-1 and/or HIV-2 (refer to the Test Result and Interpretation of Test Result section below). The test results are interpreted after 20 minutes but not more than 40 minutes after the introduction of the test device into the developer solution containing the test specimen. No precision pipeting, predilutions, or specialized instrumentation are required to perform the HIV-1/2 Saliva Antibody Home Test kit. Two pink lines appear in the result window. This indicates that the specimen contains detectable amount of H. Pylori antibody. Only one pink line appears in the control region (C). This indicates that there is no detectable H. Pylori antibody in specimen. No colored line appears in the control region regardless of the presence or absence of the test line.